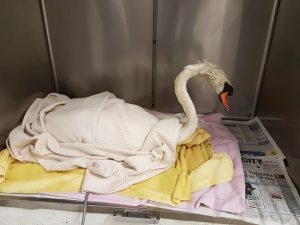 East Sussex Wildlife Rescue & Ambulance Service (WRAS) took a call on Sunday morning regarding a crashed swan walking around the car park near KFC in Lottbridge Drove Eastbourne. Members of the public were trying their best to prevent the swan from wandering into the road. WRAS rescuers Tony and Claire Neads headed down from Polegate to rescue the swan. As they arrived the swan had already been put back on the crumbles sewer which leads to Princes Park Lake. Claire and Tony noticed that the swan was struggling in the water and was becoming rapidly waterlogged and gradually sinking lower in the water. They got some rescue equipment out of the ambulance and managed to capture the swan from the back of the river. They covered the freezing bird in towels and rushed it to the WRAS’s hospital at Whitesmith near Lewes. On arrival the WRAS’s Care Team were waiting and could see the swan was covered in a substance which they believed could be cooking oil. 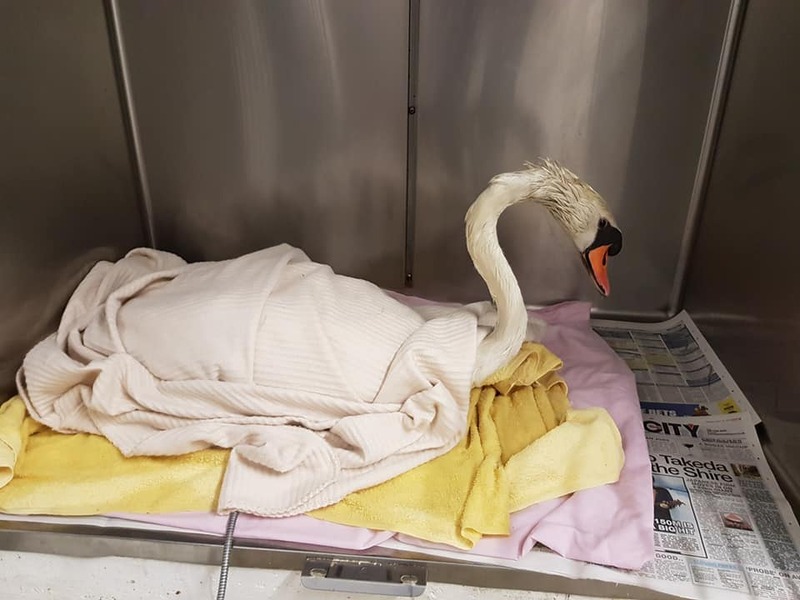 “The poor swan was clearly struggling and was soaked through due the oil taking his waterproofing away” said Lead Casualty Manager Chris Riddington. 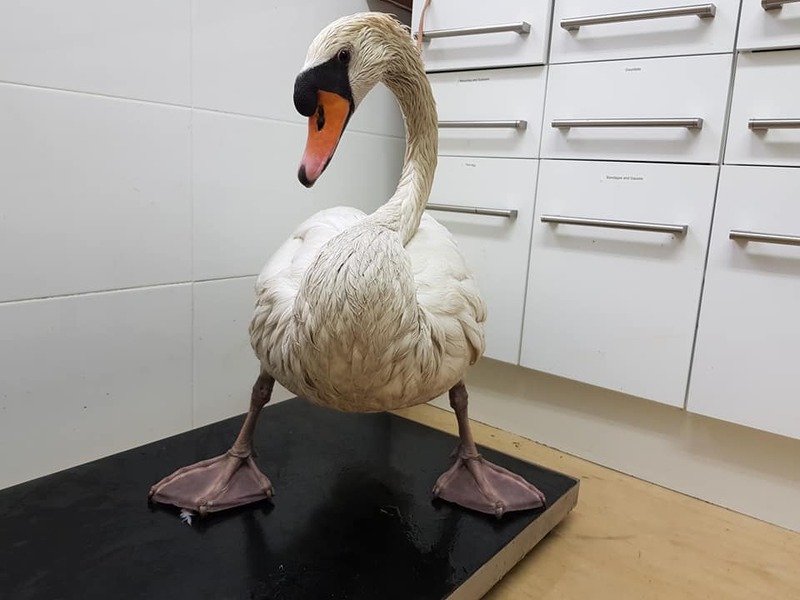 Following advice from the Swan Sanctuary, Chris and Casualty Manager Katie Nunn Nash took the swan up to WRAS shower room and using fairy liquid began to try and remove some of the sticky oil from the swans head, neck and underbelly. After a good while spent cleaning, the swan was the dried and placed on a heat mat to try and bring his body temperature back up to normal. “We are asking anyone living along the river from Princes Park to Leeds Avenue please keep an eye out for any wildlife that looks like its waterlogged or struggling like fish gasping etc. Ducks and swans should never looks sodden and water should run off their backs. This oil isn't black or obvious and will just look like the bird is soaking wet and dirty. If you have any concerns at all please call our rescue line 07815078234 and if you can see oil then contact the Environment Agency on 0800807060” said Chris. Posted in Press releases, Rescue news on April 9, 2018 by East Sussex WRAS.